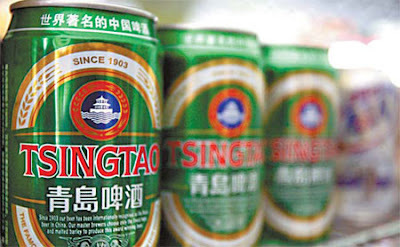 Founded in 1903 by German settlers Tsingtao is China's largest brewery. The beer is produced in Qingdao in Shandong province and now claims about 15% of domestic market share. While named for the city where it's brewed the name of the beer uses the old French transliteration and the beer's logo displays an image of a famous pier on Qingdao's southern shore. While Tsingtao brewery produces several varieties of beer, Tsingtao Beer, its flagship beer is a well-hopped standard lager with 4.7% alcohol. Originally, Tsingtao Beer was brewed in accordance with the German Reinheitsgebot ('Purity Law') utilizing only water, barley, and hops. 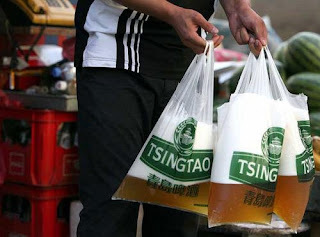 Today however, Tsingtao beer, like many other beers made in China, contains a proportion of the less-expensive rice as an adjunct in the mash but as the label states, Tsingtao is still "Made with water from the famous pure mountain water of Laoshan." Straight from the classic green bottle (or plastic bag if you prefer) the aroma is of faint grains with some hop floral notes. The first sip finds a medium bodied beer with flavours of grain and bread and a malty sweetness. A healthy hop bitterness follows the malt character and creates a beer that is pleasantly crisp. All in all a surprisingly refreshing beer that is a great accompaniment to Chinese cuisine.